I’m up here in Maine, and we’re looking at this 30′ stone chimney job, and wondering if there’s an easier way to haul stones to do the peak of the chimney (while keeping the existing scaffolding). With a small foundation platform, and one of the below lifts, I think this is a great way for contractors or construction workers to expedite the material handling/lifting process for anything that needs to be elevated. In this article, we’ll list several options for material lifts, including contractor lifts, genie superlifts, truss and rigging lifts, and manual elevators. By the of this article, you’ll be able to decide which style of lift is best for you. 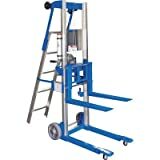 Genie Lift, GL- 8, Heavy-Duty Aluminum Manual Lift, 400 lbs Load Capacity, Lift Height 10' 0.5"
Fits older and newer style lifts. As good as OEM at a fraction of the price.